BBE BME280 is a breakoutboard for the Bosch BME280 Humidity, Pressure&Temp sensor. Interfaces: beside 6pins a Seeedstudio Grove connector. 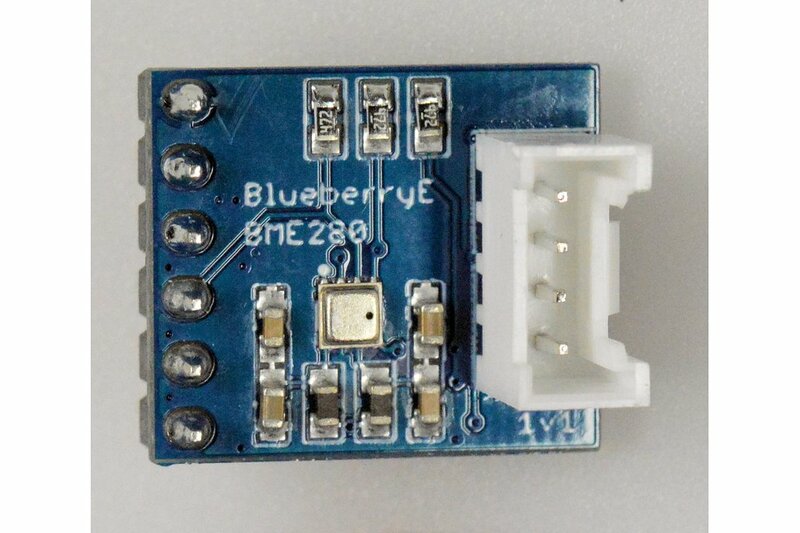 The BlueberryE BME280 is, as the name suggests, a breakout board for the Bosch BME280 humidity, pressure and temperature sensor. One unique feature is that it comes with a connector to the SeeedStudio Grove system, that way wiring etc. becomes very simple and you do not need to fiddle around with breadboards etc. In case you do not yet know the BME280. It measures in parallel humididty (± 3%), pressure (absolute accuracy ± 1hPa) and temperature ( ± 1°C). As altitude depends on pressure you can use it to estimate altitudewith an accuracy of ±1 meter. 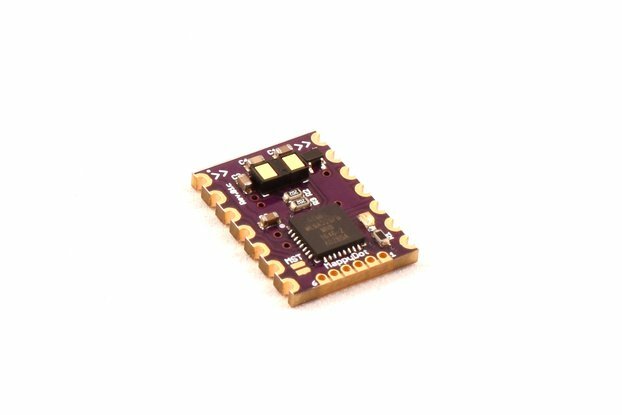 You can connect the BME280 alternatively over SPI or I2C. Operating Voltage is between 1.2V und 3.6V, typically 1.8V to 3.3V. 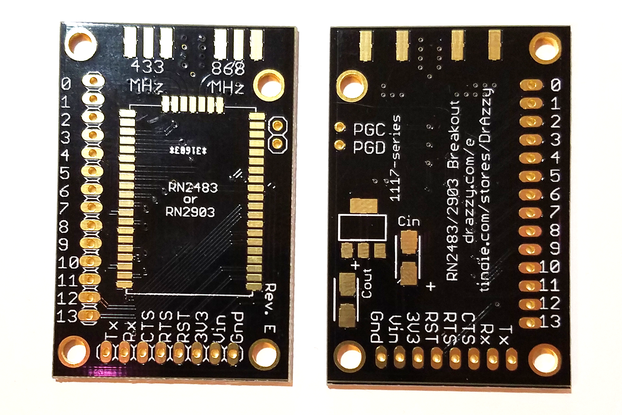 Two points: we resell also other Seeedstudio Grove products and wanted to build an BME280 board with a Grove connector. Second we developed an Arduino Uno R3 derivate BlueberryE Uno335 (soon also available on Tindie) and that one has levelshifters to 3.3V, so we wanted to build a sensor with 3.3V only, avoiding levelshifting on the sensorboard (making it smaller and cheaper). It is pretty small just 18x10mm. It fits into Grove ecosystem for easy connection but also allows to be used with a breadboard. The pin header comes unsoldered so you are free to connects cables etc. It has no onboard levelshifter to 5V in order to be small and cheap, so be careful when connecting it. At the end it is pretty cheap. The BBE-BME280 supports all communication modes described in the Bosch Datasheet (I2C, SPI 3 and 4 pin). As the BME280 has just 4 pins beside Vcc, Gnd they are used for multiple functions. The following schematic of the board details how this is accomplished. J2 in the schematic describes the pin definition of the board. 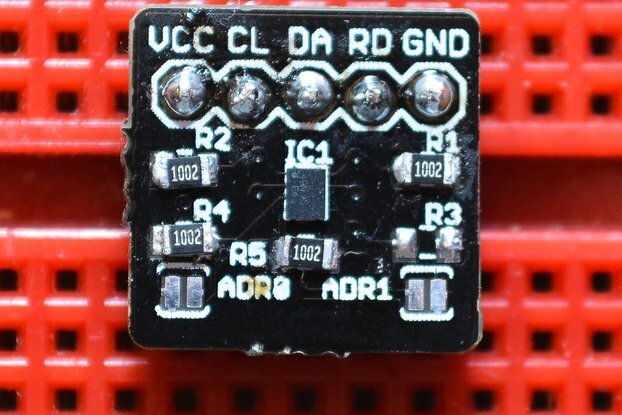 The two outside pins are Gnd and 3.3V. If you look from the backside Gnd is at the same side then the solder jumpers SJ1,2,3. A word about software, meanwhile there are plenty of opensource packages with very liberal licences for lot of different programming languages and target systems. We therefore set the software link to a search on github fpr "BME280". Nevertheless we work on our own software and will open it midterm. Expected delivery time is between 4 and 8days. The addon rate is that high as we need to insure the additional item as well.